If you're new to encryption or simply want to encrypt a file but don't want to bother setting up a public/private key pair (required by some tools), then these simple examples of using OpenSSL could be what your looking for. Simply put, a cipher is a particular algorithm used to encrypt and decrypt data. We'll show examples using AES, Triple DES, and Blowfish. This will prompt you for a password, then create the encrypted file myfile.enc (NB: use a strong password and don't forget it, as you'll need it for the decryption stage!). You'll be prompted to enter the password you used when encrypting the file. Note that if you omit the "-out myfile.txt" part, the decrypted contents of your file get sent to standard output (so if your doing this on the command line, you'll see it displayed in front of you). This will prompt you for a password, then create the encrypted file myfile.enc (Again: use a strong password and don't forget it, as you'll need it for the decryption stage!). You'll be prompted to enter the password you used when encrypting the file. AES and Triple DES are considered to be strong. Blowfish is still a good algorithm but its author (Bruce Schneier) recommends that you should use the "twofish" algorithm instead if available. Unfortunately twofish is not yet available in the list of openssl ciphers. The mode (the algorithms mode of operation) we chose to use above was CBC (cipher block chaining) mode. There are modes other than CBC mode available for your encryption purposes, such as ECB mode. Regarding AES, if you wish to use ECB mode with it instead, use -aes-256-ecb rather than -aes-256-cbc in the example. Refer to the list of ciphers to see exactly what is available, but bear in mind that CBC mode is considered to be better. 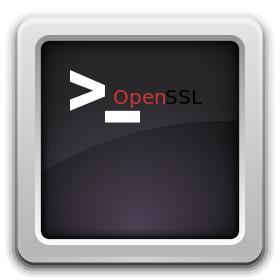 Thanks to the OpenSSL development team for producing such a handy tool.